Review by Noah Nunberg, J.D. The Chen style of taiji is generally accepted to be the source of all modern taiji styles. The serious taiji student who wishes to understand the origins and fundamental principles of this martial art is well advised to read The Essence of Taijiquan, by David Gaffney and Davidine Siaw-Voon Sim. In this book the authors thoroughly explain the history of the Chen village and its masters, the philosophy of the style, its martial essence and the modern day curriculum studied in the village of the source of this style. Additionally, the authors provide insightful interviews with contemporary Chen-lineage masters who share their knowledge gleaned from decades of practice and centuries of family tradition. As explained in the book, this style of taijiquan was created by the Chen clan in the 17th century in China’s Henan Province in the village known as Chenjiagou by the military officer Chen Wangting. Originally Chen Wangting, under the influence of the military strategist Qi Jiguang, created the original five forms of the style that over the centuries were distilled into two forms. Central tenets of these masters were “not meeting strength with strength” and “leading an opponent into emptiness.” The fundamental principles were used not only by the individual combatant but also as successful strategies for armies in warfare. Chen Wangting built upon these principles in creating the Chen style that he passed down through his descendants. The fact that these methods have survived to modernity over tumultuous centuries in which weaknesses in martial arts styles meant physical extinction proves the effectiveness of the Chen style. The authors explain how the Chen style was only taught to Chen clan members and kept secret until the 19th century, when it was first taught to an outsider, Yang Luchan(1799–1871), by Chen Changxing. This revolutionary break with the secretive traditions of the martial arts ultimately led to the proliferation of many styles of taiji that are freely and widely taught to the public today. The authors trace the history of the Chen village through times when the great Chen boxers were wellknown guardians of mercantile caravans, in the 19th century, to the times of famine in the early 20th century which forced skilled practitioners such as Chen Fake to move to Beijing to earn a living by teaching this art. There Chen Fake developed and taught the New Frame forms of the Chen style from the traditional Old Frame forms that are still taught in the Chen Village. To avoid the extinction of the clan in the Chen Village, Chen Zhaopi, at the age of 65 returned in 1958 to teach the style at its birthplace. Chen Zhaopi endured the persecution of the Cultural Revolution but died shortly before it ended. He was succeeded by such masters as Chen Xiaowang, Zhu Tiancai, Wang Xian, Chen Zhenglei, Chen Dewang, and Chen Lizhou, among others. With the new Chinese regime that arose after Mao’s death, traditional martial arts once again began to flourish, and the Chen Village and its traditional methods of teaching its ancestral style of taijiquan were reborn. Today students from around the world pilgrimage there to learn this style. The authors next review the philosophical foundations of Chen style. In a succinct but thorough chapter, the authors review the philosophical and practical theories of yin and yang energies, the paradigm of the eight trigrams, and the interrelationships of the five elements. They next reveal how these concepts relate to taiji’s thirteen main movements. The authors further explain how the complexities of the traditional Chinese medicine meridian theories were incorporated into the study and practice of Chen style. Fundamental to the development of qi in the body and directing qi to the extremities so that internal energy is harnessed into powerful and explosive physical techniques is the practice of silk reeling exercises (chansijin). The upper, middle, and lower sections of the body, namely the hands, waist, and feet areas, are synchronized so that the internal and external energies developed in the body combine into each integrated technique. As explained in the book, the development of such energy requires years of daily and diligent practice. The authors also generally review the breathing methods incorporated in this system of taiji. The book has an important chapter on the martial aspects of Chen taiji. Prolonged practice of the taiji forms is deemed essential to the development of the techniques, and out of this practice, practical applications used in fighting emerge. Yet ultimately the highest level of taijiquan is said to be formless: that is, one must instantly react to the innumerable and unpredictable conditions encountered when facing an opponent. Prolonged practice of the techniques in the forms develops this skill. In the next chapter the authors explain the syllabus used in the Chen training system. From seated to standing meditation one goes next to silk-reeling exercises that are explained in the book. Next, two main practice routines are studied, which are followed by partners training in push hands (tuishou). The Chen-style masters also train their students in weapons, including the taiji sword, the broadsword, the halberd (guandao), and the spear. The book provides auseful glossary in English and Chinese of the numerous techniques associated with each of these weapons. The book ends with interviews of, and articles by, one female and five male masters of the style. These masters provide candid remarks about what inspired them to practice diligently, what aspects of training they emphasize in their own development, and their deep insights regarding training in Chen style. I highly recommend this book to students and teachers of any taiji style, given the fact that Chen style is the wellspring of taiji. The Essence of Taijiquan not only makes a complex system easier to understand for the novice, it also provides a wealth of knowledge to the seasoned practitioner. 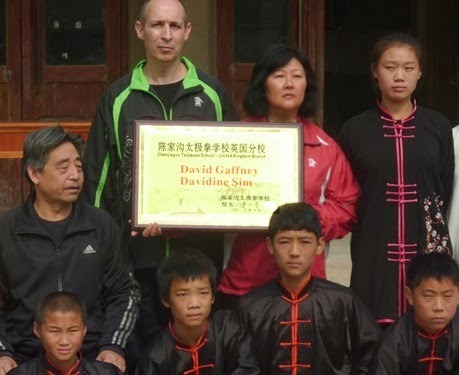 In The Essence of Taijiquan, David Gaffney and Davidine Siaw-Voon Sim provide a storehouse of intellectual tools to permit any serious taiji student to penetrate the complexities of the Chen style.